Surprise continues to surprise with her willingness and ability to learn. Back to Surprise. We're in regular lessons with Jane Fraser - usually one or two weekends a month we have Saturday and Sunday lessons, plus one or two Tuesdays every month. Contact - Surprise stays in a lovely position pretty much all of the time, but it can be deceiving. She isn't always taking a good contact and using her back. Sometimes she's just tucking her head into a pretty frame :). When she was first backed she curled up behind the vertical a lot, but as she gets stronger and more confident in what we're doing she is taking more contact. Some days are better than others but she's definitely coming along. 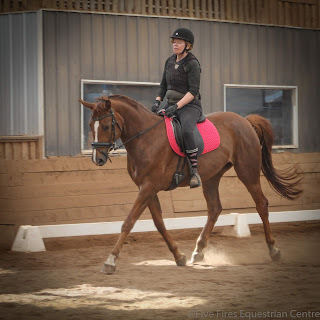 Canter - The transition into canter from trot can be tricky but I think it's more me than her. This is especially true on the left lead where I tend to turn my body too much to the left. I have another lesson today so we'll work on that! For the most part she canters very nicely once she's into canter. She still needs to build her strength but it's going very well. Jane has me cantering very forward with her (not rushing - just a big canter), so she understands that we want her to canter and use her hind end. Surprise looks lovely. It all takes time to get it right but for me getting there is half the fun. I’ll be interested to hear about Rogo, I love that horse. She's a quite lovely looking filly. Grey Horse Matters that's so kind of you to say. I'm posting about it soon - just need more info but it's positive. Thank you.